No collision in coalition at cocaine crush ! President Maithripala Sirisena has continued to be at the receiving end of strong criticism, even after the Supreme Court put an end to speculation about the duration of his term on Sunday (14). The Presidential Media Division confirmed that the five-judge bench of the Supreme Court which held a public hearing on the question posed by President Sirisena about whether his term would end in five or six years, had communicated its decision to the President that he could hold office for a period of five years according to the Constitution. The decision resulted in widespread relief after fears that the President was seeking the opinion of the country’s apex court to stretch his term of office – changed to five years through the 19th Amendment – to six years. The Attorney General’s interpretation that President Sirisena assumed office before the passage of the 19th Amendment and was therefore entitled to serve a six-year term; and his argument that reducing his term to five years would be an infringement of the sovereignty of the people and the franchise, appeared to have been rejected by the Supreme Court which appeared to hold that the current President was also subject to the provisions of the 19A. Speaking to Daily FT, Executive Director of the Center for Policy Alternatives Dr. Paikiasothy Saravanamuttu, said he found it “rather odd” that the Attorney General would come to court and offer this constitutional interpretation. CPA also intervened in the public hearing, holding that the Constitution entitled President Sirisena only to a five-year term. “Perhaps the AG genuinely believed it could be interpreted this way. But it is a fairly straightforward reading and it confuses me that the AG could come to court and say this,” Dr. Saravanamuttu noted. The 19th Amendment, sometimes called the single most significant achievement of the Yahapalanaya Government to date, contained specific transitional provisions to clear any doubt about the powers of an incumbent President and Prime Minister, subjecting persons holding those offices at the time of enactment to the provisions of the new amendment. He added that the CPA was very happy that the Supreme Court had agreed with their interpretation of five years, since the whole issue was fairly straightforward as per the 19th Amendment. “But it is confusing as to why the President should ask for an advisory opinion on the duration of his term at this point in time – or at all, given that we were led to believe that he came to office to abolish the presidency,” the CPA chief added. Holding a press briefing yesterday, JVP General Secretary Tilvin Silva echoed these sentiments, saying that it was ironic that President Sirisena who came to power promising to abolish the executive presidency was now asking the Supreme Court if his term was five or six years. “The President is not fulfilling his mandate. Instead his preoccupation is with protecting the SLFP and establishing his power in that party,” Silva accused. The JVP General Secretary also accused President Sirisena of “ulterior motives” in seeking this Supreme Court opinion at the height of election season. As per the Supreme Court determination on the question of President Sirisena’s term of office, presidential elections will be declared at the tail end of 2019, giving the incumbent President roughly a year and 10 months in which to pursue his policies. 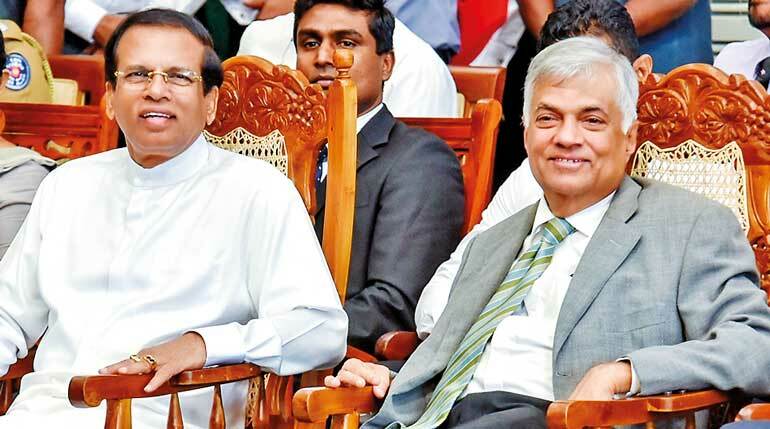 The current Parliament, which was elected in August 2015, will outlast President Sirisena unless he seeks and wins a second term of office in 2020, something he vowed not to do when he was elected in January 2015. Under the terms of the 19th Amendment, President Sirisena will be unable to affect the dissolution of Parliament before his first term expires, since the amendment prohibits a president from dissolution of the legislature until it reaches the 4.5-year mark, or in this case, February 2019.